Here's my confession: Sometimes, I just get out fabric, iron it extra crisp, and then fold it and put it away. I'll spend a whole afternoon doing this. My husband says it's an addiction. Hey, it's way better than watching fishing. I totally understand how you feel, but I also have it the other way, with the felt I make. Sometimes a piece will come out, and it just isn't good enough in my eyes, but I know I can make it into something else, however, my darling husband will quite often stand there saying "no, don't do it!!'!!!! that pencil holder is cute, cute, cute! And I must confess that I CUT with no qualm and no regret. It's the only risky behavior in my life. Ha! I have the same dilema with two old quilts...they are stained with large holes and falling apart in some places and perfect in others and yet I just can't seem to cut them apart. 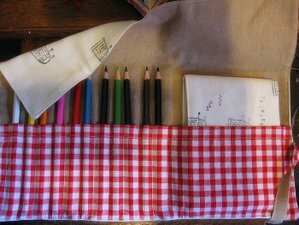 I love the pencil case, too. I have that same monkey fabric from Debbie! I can't cut it, either. I have to feel that a project is "worthy" of using my favorite fabrics or not. Perhaps we should start a support group "Fabric Stashers Anonymous". I completely understand. Children & cute animal novelty prints are my FAVORITE. 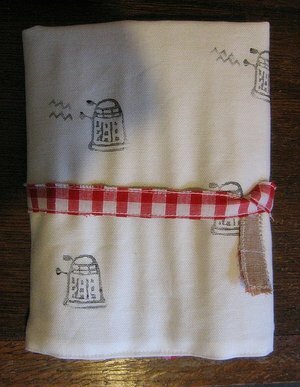 I LOVE LOVE LOVE your dalek fabric. It is so cool. I know that may make me (as an American) a complete sci-fi geek, but so be it! You're too funny. And yes, you're right, I do understand you. Such a nice pencil holder... and the credit card cutie...! Sweet. I think as a fabric collector as I understand myself you are legitimized to not cut all the time. I reached that point some time ago - I buy fabric without any intention to cut - ever. I am not always feeling good about that attitude but I think it's natural to collect, no matter what. I know what you mean. Really I do. I've actually thought about framing pieces of my favorite fabric, but then I woudln't be able to touch it! Maybe a quilt...but that would involve cutting! What to do? I totally undesrtand. 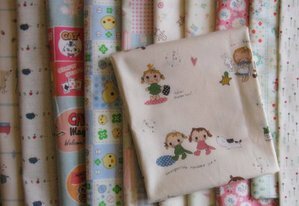 Those kitty craft fabrics are so very beautiful, I would be crying if I had to cut them. I haven't been able to cut any of my Kitty fabric either. And the Merry Bonbon fabric, and the links to other fabric wonderlands off of that site, well, that's almost too much to ask of a mere mortal. But I must encourage you to CUT CUT CUT the fabric in the last photo. I can't wait to see what you make! That Dalek is one cute robot. What a great pencil/sketchook holder and the adorable credit card holder, well, I'm verklempt. I am not really a sewer (I like to do it but do really basic stuff and prefer to knit...) but I have the same fabric cutting problem! I thought it was just me. When I was in Uganda I bought SO much fabric, and now that I'm home I can't bear to cut any of it... It's just sitting in my basement, looking pretty... maybe one day I'll cut into it, but then again, maybe not. 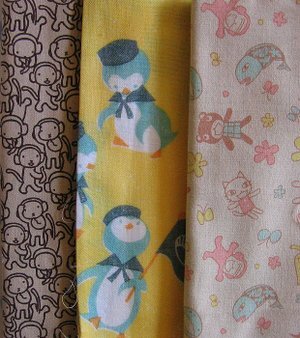 Sometimes I think I should buy fabrics in sets--one piece for stash, one piece to make things. There is definitely a wisdom that comes with age, and being 41 I say CUT IT!!! I have fabric that I don't want to cut either, but when I did a big clean out of my stash I found fabric that I couldn't cut 20 yrs ago. And guess what? I don't even like it anymore and gave it away! Use it while you are passionate about it! Life's too short--cut it! You can't take it with you---it doesn't fit in the nether world. And if you still have a problem with it, send it to me, I'll cut it for you and everyone else for that matter. What no wine post this weekend? oh, and I just read Kristy's comment above and yeah, we over 40 say CUT it because we are so wise. one last thing, if you can't cut it then frame it. Some of that does belong in a museum though so I do understand. 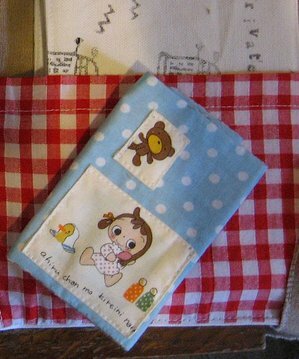 the duck fabric at the top (on the CC holder) says 'ducky is getting clean, too!' Cute! Every time I see kitty-craft fabrics, I have insane rushes of lust. And then I must go to confession. Over 40 and I say CUT!!! I mean, I guess the unused fabric serves a function as art for you to gaze at and enjoy, but you bought it to make something out of it, right? Here's a morbid thought: do you want some young woman to blog about the great fabric she found at your estate sale? No, you want to make great projects which will be heirlooms. Beautiful work and wonderful fabric. You'll cut it when you find the right project. 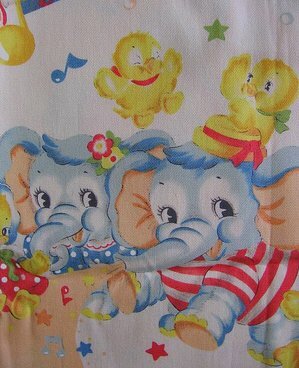 I have an armoire full of such fabric. I must confess, I've been viewing your blog for months and finally decided to chime in. Every time we see something new, my daughter begs "let's make that, no that, or that." And then we get nothing done that we're supposed to. But checking in with Molly chicken saves my sanity. Thank you. So completely understand. I have far too many pieces of very beautiful material, which all had a definite purpose when I bought them, which still lie uncut. I'm terrified I'll mess up a beautiful piece, or not do it justice (hello? like material has a conscience?). I'm trying to let go.......but it's so damn hard! I stash fabric and I really don't even sew. It does find its way into my collages though. I can't get over the black and white monkey fabric. Do you know where it came from? My husband often comments on my problems with stashing fabric. But I can't help it. Whenever I see a fabric I like I want to purchase it. I know sooner or later I will use it. I know how you feel...I am the same with both fabric & paper...the finished credit card holder is so adorable though...worth cutting for! I wouldn't cut up the monkey fabric in that last one either. I love it! Like most of the other comments, I have to say that I'm totally with you on the fabric worship. In fact, my WhipLash entry for July had to do with just that. for those who might be interested: http://jixichick.blogspot.com/2006/07/whiplash-competition-july-lemon.html ). I took the opportunity of this challenge to make myself cut into this piece I had been saving for so long. It still didn't "cure" me though! 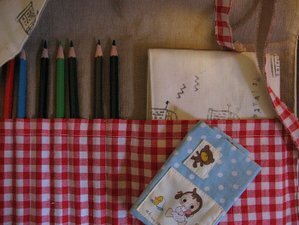 I love your fabrics,im sure you will make some lovely things from all of them, love reading your weblog and have added your link to mine.Keep up the good work! The Dalek pencil/sketchbook holder and credit card holder are both amazingly fab - but what really has me hyperventilating is the monkey fabric! Dear Lord, could that be any cuter???? Oh you have struck such a chord with me, and others by the looks of it. I don't normally comment, just read and enjoy but I am so in sympathy over the "cutting" business. Why oh why am I always saving these fabrics for something better? I have got to get over this and live dangerously. Your credit card holder is particularly beautiful and I always enjoy seeing your creations. I know how you feel; my fabric basket is getting rather overfilled and has spread into many boxes because I cannot bear to cut it up! Your fabric collection is beautiful, I'm very envious!